Located by the Meia Praia beach in Lagos, this 5-star adults only hotel offers the perfect conditions for a romantic holiday as a couple. Enjoy on-site spa facilities, an outdoor pool with panoramic ocean views and luxurious rooms. All rooms feature private balcony, air-conditioning, minibar, satellite TV, and free Wi-Fi. 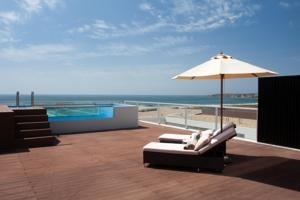 The premium suites have a private pool and panoramic ocean views. The Restaurant serves international cuisine. Guests can also enjoy their meals at the restaurant terrace and views of the pool. Guests can make use of the well-equipped fitness centre with natural light and overlooking the ocean. Relaxation facilities include hot tub, sauna, and an indoor pool.